Windmill Point Lighthouse – Chesapeake Chapter U.S.L.H.S. Windmill Point Lighthouse was built in 1869 at the entrance to the Rappahannock River on the north side. Three separate lightships were originally stationed here from 1834 until the lighthouse was constructed. Confederates took the first lightship in 1861. The lighthouse was a white hexagonal screwpile style that was assembled at Lazaretto Depot in Maryland. It had a fifth order Fresnel lens. It had two additional fender piles, one on each of the ebb and flow sides of the structure for additional stability against ice flows. By 1905 Windmill Point was one of the oldest screwpile lighthouses in the district and structurally weak. Riprap stone was added to shore up the lighthouse. However, the ice flows in the winter of 1917-1918 damaged the piles and braces. The lighthouse was repaired in 1921. 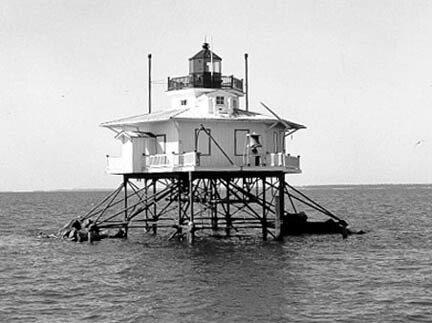 The light was automated in 1954 and dismantled in 1965. sections of the lighthouse were sold to Dr. Wallace Atwood, owner of Windmill Point Marina. Atwood’s dream to rebuild the lighthouse on shore and rent it out to visitors never materialized. It was replaced with a small automatic beacon on the original foundation.